The Icom IC-A14 Series is the ideal flight companion for the student pilot. This radio practically pays for itself by saving pilots both engine hours and fuel during preflight communications with the tower. By offering two versions with this series users can select from a full keypad version or a simplified four button version this is more suited to ground crew operations. 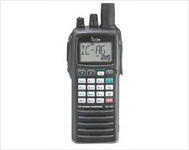 The IC-A14 full keypad version allows you to input the channel or frequency directly and has an exclusive button for the 121.5MHz emergency channel. 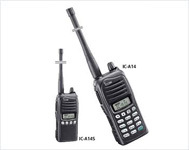 IC-A5 & IC-A23Is an Air Band Radio. 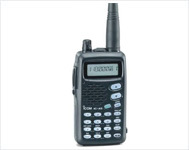 The pilot's favorite handheld Radio is here.VHF Air Band Radio Transreceiver. Fly The Airwaves with this simple air Band Transreceiver. With VOR Navigations & also with Voice Recording & playback function. The pilot's favorite handheld is here. Easy to use while flying Simple one-handed operation is the most essential feature of the IC-A24/A6... The well labeled, large keypad provides user friendly operation. The large display shows both letters and numbers and is easy to see, making for fast frequency recognition.